Pretty little All-Bisque Doll. 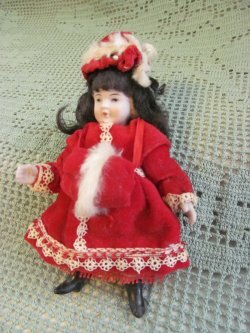 Nicely dressed in red velvet and lace trim "Christmas" outfit. She has jointed limbs and head with delicately painted features. Her clothes are not removeable. I can't see any marks or numbers on her head or back. Not sure of her age~she is definitely not a new doll. She's in very good condition. Stringing is tight. Her dark brown mohair wig is covering her original molded hair~~if you move the brown hair aside you can see it covers her blond ponytails! Body looks in good shape. I can't see any damage. Wonderful clothing. Someone took extra special care in making them just for her! She is wearing a red velvet coat with matching hat and muff. The coat is trimmed in tiny picot lace. Her hat and muff have real fur trim. Underneath she a red petticoat and pantaloons with red lace trim. Clothes are in excellent condition. No damage. No stains or fading. The clothes are stitched in place but I did snip a stitch at the back neck to try to see if she had any markings.